Not bad, huh? There's a ton of candles and even some nice luxury cotton pillowcases in there for the guest room. I've gotta admit, I sorta wanted to decorate for Christmas all over again with some of my new purchases. I mean, some of these things I paid 11 cents for. Yeah, you read that right! 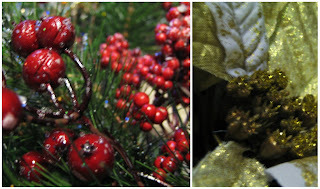 Everything Christmas was marked 80% off, and some of those discounts were on top of previous 10 or 15% discounts. ...and my favorite scent, coconut soap ($4.99)! 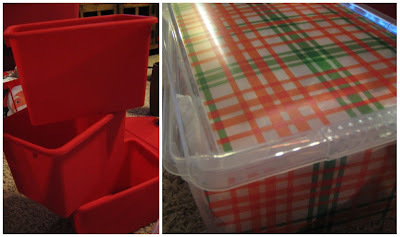 I'd also recently gotten some mini holiday storage bins at Lowe's for $2 total. They're the perfect size for holding all the Christmas ornaments off the tree. Before, I'd been using old paper ornament boxes and gift boxes. These new bins will be much sturdier and they all fit better inside my larger Christmas bins. I like to purchase color coded storage so I know what's inside without having to label things... red and green for Christmas, orange and black for fall and blue for any spring and summer storage. After I'd gotten the rest of Christmas organized and stored away, which included some of my new purchases, I went to work trying to spruce up our mantel. It's slightly larger than in our last house and the space and area around our fireplace isn't very occupied, so I wanted it to seem "full" and "on purpose." A few candlesticks and casual frames weren't cutting it. It has a lot going on, but I like the busyness of it since the flag is so simple and the space around the fireplace, as I mentioned, is pretty open and plain. I had fun gathering things from around the house to arrange on there. These Texas star candle holders are a longtime favorite of mine. This candle (a Christmas gift from my sister-in-law) smells great and I love the monogram. Sunflowers poking out the top of a cowboy boot add a bit of color. This welcome sign balances on top of a few books for added height and dimension. a Christmas gift several years ago from my Sister and Sabrina. A horseshoe frame and one of our favorite wedding photos add a sentimental touch. 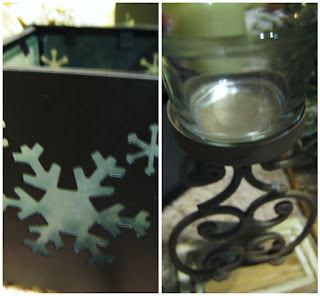 I purchased a trio of these votive candle holders for just .79 cents apiece! I like the juxtaposition of the iron star and gold glass chablis. Details like this small candle holder help keep things cohesive, using both bronze and gold. This is another Trail of Painted Ponies piece, perched below the bronze table lamp. The rustic charm of this table is aesthetically pleasing. Plus, it was a $35 find on Craig's List! We can't leave Herman out! This was a housewarming gift and my husband loves penguins. The finished product, welcoming you into our home! Have you rearranged or redesigned any part of your house lately? Have a unique Christmas storage system you rely on? Share your thoughts in the comments section, and leave a link to any posts you have done about it! Everything looks GREAT!! I will try to 'share' and link to this later this afternoon. I have been wanting to try this.